This is information about most Narow Gauge Railways in Poland. Also in 1895 the first section of the Kolberger Kleinbahnen opened, and eventually this system consisted of lines from Kolobrzeg (Kolberg) to Resko (Regenwalde), Karlino, Wlosciborz, Slawoborze and Tapadly. In 1896 the first section of the Greifenberger Kleinbahnen opened to 750mm gauge from Gryfice (Greifenberg) to Niechorze (Horst Seebad), and in 1898 another line opened from Gryfice through Tapadly (Dummadel) to Dargoslaw (Dargislaff). When the Kolberger Kleinbahnen reached Tapadly in 1899 the problems of different gauges became all too clear and in 1900 the Greifenberger system was regauged to 1000mm. Further extensions included a line from Popiele, just west of Gryfice, to the harbour of Stepnica, and by 1913 a circular route had been completed from Gryfice through Niechorze, Trzebiatow and Tapadly and so back to Gryfice. There were also a number of relatively short branches to Mrzezyno, Trzygolw, Sniatowo and Rokita. Also in 1896 the Regenwalder Kleinbahnen opened a metre gauge line from Dobra Nowogardzkie (connecting with the Saatziger system) to Lobez. In 1907 a further line opened north to Resko, thus connecting the four metre gauge lines into a single network. To the east of the metre gauge lines there were two 750mm gauge systems, the first sections of which opened in 1898. The Koeslin – Bublitz – Belgarder Kleinbahnen eventually ran from Koszalin (Koeslin) through Manowo (Manow) and Swielino (Schwellin) to Bobolice (Bublitz), with branches from Manowo to Naclaw and from Swielino to Bialogard (Belgard), from there a reversal gave access to a line to Rarwino (Rarfin). At Naclaw there was a connection with the Schlawer Kleinbahn, running south to Polanow, Zydowo and Gologora. Most of the Schlawer Kleinbahn was converted to standard gauge in 1934, but part was kept as mixed gauge to allow 750mm gauge trains to reach Polanow. After the Second World War Pomerania became part of Poland, but the railways were in a very poor state. The 750mm gauge lines had been dismantled by the Soviets in 1945/6 and the Koszalin - Bobolice and Swielino – Bialogard – Rarwino lines were rebuilt to metre gauge and, by construction of a new 6km section from Rarwino to Lepino Trojkat, these lines were linked to the rest of the metre gauge in 1952. In 1959 the network extended to 555km of lines; some sections did not reopen after the war. Lines in the Kolobrzeg area closed as early as the sixties, and there were closures and service reductions elsewhere. However in 1989 the system still had 461km of track, and carried 700,221 passengers and 349,932 tons of freight. In 1995 the system was recorded as being 460.8km, of which 350.7km was operational, and by the beginning of 1996 this had dropped to 440.1km and 335.7km respectively. In that year the system was cut back quite severely, so that only three sections survived in operation: Stargard – Dobra Nowogardzkie, Gryfice – Trzebiatow and Koszalin – Swielino. After a series of reductions in the timetable, regular passenger services ceased in June 2001, the last trains on the Stargard – Dobra Nowogardzkie line were on 9 June, when railcar MBxd2-307 formed the 05.15 departure from Dobra Nowogardzkie and the final train, the 09.00 from Stargard to Dobra Nowogardzkie. Summer services continued from Gryfice as far as Pogorzelica Gryficka (Trzebiatow could no longer be reached due to problems with a weak bridge). One return tourist train also continued to operate from Koszalin daily until the end of July and then at weekends until the end of August. In April 2000 only the Stargard line showed any evidence of freight traffic, and that was very light and probably ceased by the end of September 2001. Some freight traffic apparently survived on the Koszalin line, to an airfield, but that also ceased in 2001. A local authority is believed to have taken over the Stargard – Dobra Nowogardzkie line with the intention of restoring regular passenger and freight services, probably operated by SKPL. Similarly a local authority is believed to have taken over the Koszalin – Swielino line, but it is not known whether the intention is to operate regular services or merely tourist trains. There has also been mention of reviving the Dobrzany – Kozy Pomorskie – Insko section of the Stargard system, which closed in 1996, for tourist traffic, but nothing appears to have happened as yet. The only line currently running trains is Gryfice, which runs tourist services in the summer to Pogorzelica (although most trains only run between Rewal and Pogorzelica, with just one working out from Gryfice in the morning and one back in the evening. The first section of the Schmiegeler Kreisbahn opened on the metre gauge in 1900 from Stare Bojanowo (on the Poznan – Leszno line) eastwards 18km to Krzywin. The following year it was extended westwards from Stare Bojanowo through Smigiel and Wielichowo to Ujazd. Services to Ujazd did not last long, however, as the Lubnica – Ujazd section closed in 1905. Another western terminus appeared in 1910 when a line was built from Wielichowo to Rakoniewice (served by the standard gauge Poznan – Wolsztyn line). The Wielichowo – Lunica section continued in operation as a freight branch until 1924. Following the Second World War PKP carried out a programme of rationalisation of narrow gauge lines, and the Smigiel route was regauged to 750mm, with the metre gauge equipment being transferred to Pomerania. The Wielichowo – Rakoniewice line probably closed in the 1960s. In 1989 the line was quoted as 34km long and carrying 230,638 passengers and 72,448 tons of freight. By 1996 it line was officially given as 23.7km long, following closure of the line east of Stare Bojanowo. The timetable was gradually reduced until regular passenger operations ceased completely on 22 June 2001, this being the last day of normal passenger trains running on the PKP narrow gauge railways. Freight traffic continued to be quite heavy until this too ceased in December 2001. The line was taken over by the local authority and is now operated by Stowarzyszenia Kolejowych Przewozow Lokalnych, based in Kalisz. Passenger trains (Romanian-built railcars) started running again in February 2002, and freight services (standard gauge wagons on 'Rollwagen' hauled by Lxd2 diesels) followed some time later. In June 2002 freight trains were only running occasionally, probably less than once a week. The passenger timetable was cut back for the summer period, with only four trains per day between Smigiel and Stare Bojanowo. With the start of the new school term the timetable was increased significantly, and the Sniaty services were extended to Wielichowo for the first time in a decade. By October freight traffic had also increased, with coal being carried on a daily basis from Stare Bojanowo to Smigiel, Witowo Polski or Wielichowo. On one occasion there were two railcars and two freight trains in operation at the same time. It is to be hoped that this revival of traffic will continue and grow in strength. Maciej Matuszewski's book "Z dziejow Smigielskiej Kolej Dojazdowej 1900-1990", published by Poznanski Klub Modelarzy Kolejowych in 1990, is unfortunately no longer available. There were once branches from Tulce through Szewce to Kruszewnia and Gowarzewo, but they do not appear to have survived the gauge conversion. By 1989 only the Sroda – Zaniemysl section survived, which was quoted as being some 17km long. In that year 121,305 passengers were carried, and 17,981 tons of freight. Certainly until 1999 the line remained entirely steam worked, with passenger trains typically consisting of a Px48, two ‘traditional’ coaches and a luggage/brake van. When freight had to be moved a standard gauge coal wagon on ‘Rollwagen’ was added to form a mixed train. The line was threatened with closure in 1996, but was reprieved following intervention by the local authority. In October 1996 Px48-1920 was delivered newly overhauled from Pila works. By 1999 a Lyd1 diesel locomotive had arrived, but it is not known if this actually saw any use. Rumours had circulated for many years that Romanian rail-cars were to be introduced, and in 2000 at least one of these replaced steam (at least on the weekday services). Regular passenger services ceased on 8 June 2001 when railcar MBxd2-229 operated trains 7727 (Sroda – Zaniemysl) and 7728 (Zaniemysl – Sroda) after which driver Andrzej Noworski closed the shed doors for the last time. 'Tourist'' trains continued to operate at weekends and to order through the summer, but all operations have now ceased. Reports suggest that the bridge over the standard gauge line at Sroda is in need of extensive repairs (the freight services may have ceased before the passenger services) and, although it is believed that the local authority has taken over the line, services have not yet commenced. Maciej Matuszewski's book "Z dziejow Sredzkiej Kolej Dojazdowej 1902-1987", published by Poznanski Klub Modelarzy Kolejowych in 1989, is unfortunately no longer avaialable. This line (formally named the Krotoszynska Kolej Dojazdowa) dates back to 1900. At one time the line ran from Krotoszyn through Pleszew to Broniszewice, a total distance of 50km. The Pleszew Miasto – Broniszewice section only opened after the Second World War and closed in 1972, while the Krotoszyn – Pleszew Wask. section closed in about 1987. This left a section about 5km long from Pleszew Miasto to Pleszew Wask., on the standard gauge Jarocin – Ostrow Wielkopolski line. In 1989 the line carried 189,091 passengers and 343,213 tons of freight. However, the line was mixed standard/narrow gauge throughout almost its entire length, and all freight was carried by standard gauge trains. Narrow gauge (750mm) trains used to always be two Romanian coaches hauled by a Lyd1 diesel, but one or more Romanian rail-cars were introduced in about 2000. Following a gradual reduction of the timetable, the last trains ran on 9 June 2001. This duty was performed by driver Pawel Piorek and conductor Czeslaw Dymny operating railcar MBxd2-216 with the last pair of trains being 7426 leaving Pleszew Miasto at 16.53, arriving at Pleszew Wask at 17.03, leaving Wask again at 17.34 and arriving back at Miasto at 17.44. The event was commemorated with a headboard and Polish flags on the front of the railcar, and a number of local residents and railway workers rode or watched the train, with detonators exploding on departure from Wask and arrival at Miasto. It was rumoured that the local authority was interested in taking over the line to run tourist trains, but this does not appear to have happened. This large network has its origins in sugar beet railways which were first built in the latter part of the nineteenth century. Much of the network came into existence as supply lines for the German military in the first months of World War I. At one time there have been sections of 600mm, 716mm, 750mm and 900mm gauge, but the entire network is now 750mm gauge. The PKP network is (or was) linked to a number of sugar works lines, but there has been a gradual reduction in traffic and a number of lines have closed. Krzywa Gora - Zieliniec - Bieganowo Wlkp. At that time, however, the PKP network had junctions with a number of systems owned and operated by various sugar works. Kruszwica sugar works (after taking over the network formerly owned by Matwy sugar works) had a network of some 320km of track, connecting with PKP at Piotrkow Kujawski and Walentynowo. Tuczno sugar works had about 160km of track, connecting with PKP at Przybranowo and possibly with the Kruszwica system. Brzesc Kujawski sugar works had a network of some 200km of track, connected with PKP. Ostrowy almost 50km and Goslawice about 10km. Lesmierz sugar works’ railway system, although crossing the PKP tracks between Leczyca and Ozorkow, was mostly 600mm gauge. Thus the connected system in the Kujawy area at the end of the 1950s probably amounted to almost 1500km of lines. On the PKP network closures started in earnest in the 1960s, with the Kolo – Dabie Kolskie line closing completely in 1963, and the 7km line from Wloclawek to Wloclawek Port in 1968. Other short branches such as Kruszyn – Guzlin, Krzywa Gora – Zieliniec, Zieliniec – Bieganowo and Zydowo – Gorazdowo all closed in the late 1960s or early 1970s. The Jablonka Slupecka – Konin section closed in 1965, and Wrzesnia – Sokolowo in 1972. Grotkowo – Czeluscin and Mierzewo – Stanislawowo closed in 1973 and in 1976 the Wrzesnia – Pyzdry section closed. In 1985 the line from Aleksandrow Kujawski to Straszewo was lifted but in 1986, in connection with expansion of the nearby brown coal mine, the line between Jablonka Slupecka and Slesin was rebuilt on a completely new alignment with a large yard at the junction with the Wilczyn branch, heavy rail and colour light signals! By 1989 the system had 384km of track on which were carried 297,279 passengers and 544,001 tons of freight. In 1992 the lines from Krosniewice to Dzierzbice, Krzewata and Opiesin were all lifted. On 1 December 1992 the system was split into three divisions based at Gniezno, Sompolno and Krosniewice. Bogdan Pokropinski’s book “Kujawskie Koleje Dojazdowe”, published by Poznanski Klub Modelarzy Kolejowych in 1994, is a good history of the network and copies may still be available. Hopefully one day there will be a fully definitive book on the fascinating history of this truly unique system. It is surely a deserving case. In April 2000 a tour was organised which covered virtually the whole system over six days with Px48 traction throughout. PKP have produced prices for running charter trains, and for a group of twenty or so enthusiasts the cost of such a trip is not unreasonable in western European terms. But anybody thinking of attempting to tour the whole network should do so soon. The Gniezno line has its origins in a 900mm gauge railway 18km long serving the sugar factory at Gniezno. This line was taken over by the local district, rebuilt to 600mm gauge and extended, so that it ran from Gniezno to Mielzyn. A further line was built from Niechanowo through Witkowo to Powidz in 1896, and in 1911 this was extended to Anastazewo. In 1913 Goslawice sugar works built its own railway from the works to Anastazewo but, being on the Russian occupied land, this had to be 750mm gauge. The delivery of the 750mm gauge locomotives to Anastazewo by 600mm gauge train from Gniezno must have been an interesting sight. Similarly, the coal for Goslawice sugar works had to be transhipped from standard gauge to 600mm wagons at Gniezno and again to 750mm wagons at Anastazewo. After the Second World War the Gniezno system became part of PKP’s Kujawy system, and it was converted to 750mm gauge in the early 1950s. After closure of the Mielzyn – Niechanowo section in 1984, only the Gniezno – Anastazewo line remained. In 1996 the system was recorded as being 38.0km long. Until recently the line was entirely steam worked, with passenger traffic limited to excursion trains run to order. However, a timetabled summer weekends service was then introduced, while in summer 1999 a Lxd2 diesel arrived. Standard gauge wagons were carried on ‘Rollwagen’ from Gniezno to Niechanowo, Witkowo and Powidz. Passenger trains could of course be run to order. The local authority has taken over the line and, as well as running tourist trains during the summer season (and at other times to order) some freight traffic survives at least to Niechanowo and possibly Powidz, although traffic to Witkowo appears to have ceased. The Sompolno division represented the central area of the Kujawy network, although it also extended eastwards across the Krosniewice division to Brzesc Kujawski. The origins lay in former sugar works lines, German military lines and links built under early Polish administration. Sompolno itself was once the main wagon workshop of the Kujawy network, and had a very extensive track layout. In recent years the division carried only freight (all on ‘Rollwagen’) hauled by Lxd2 diesels from the standard gauge interchange at Kolo, on the Poznan – Kutno line. As well to Sompolno itself, freight was carried west to Slesin, Slawoszewek and Wilczyn, north a few kilometres to Wierzbinek, and east to Izbica and Brzesc Kujawski. On 1 January 1996 the Sompolno division had 142.9km of track, of which 132.5km were in use. Following PKP's cessation of narrow gauge activities in December 2001 the line does not appear to have seen any traffic. Krosniewice was the main locomotive works for the system. In 1994 there were still passenger services north to Boniewo, east to Ostrowy and south to Ozorkow. On 1 January 1996 the division had 180.6km of track, of which 160.8km were in use. The Ozorkow line closed in May 1996 as a result of work on the Warszawa – Berlin line, which crosses over the narrow gauge near Krzewie. About the same time services north were cut back to Cetty, and a few years later to Wielka Wies. At the south end of Krosniewice station the railway is crossed by the main Warszawa – Poznan – Berlin road and when the road was resurfaced without any provision for the railway it seemed certain that the last trains had run in that direction. It was therefore something of a revelation in 1999 when services were resumed, albeit only three times a day, to the main line station at Krzewie. These were however short-lived, for all regular passenger traffic ceased in June 2001. By that time it had been realised that the line south to Ozorkow was situated close to a large centre of population at Lodz, and 'tourist' trains had operated on a few days on that line. As recently as October 1997 the works was still servicing narrow gauge freight wagons for the sugar beet traffic at Dobre, and appears to have done so again for autumn 2000. There was a little freight traffic to Krosniewice itself from the standard gauge interchange at Ostrowy, and in May 2001 a new siding connection had been laid in just to the north of Krosniewice, to serve a factory, although the track had not been carried across the adjacent road. Amazingly, although the line was due to close within a few months, this new connection was completed. If it ever carried traffic it must have been very short-lived. Krosniewice's main claim to fame in recent years was as the one remaining haunt of the old Polish-built railcars, dating from the 1960s. In May 2001 one of these was still in service and two others were parked outside the shed apparently in operational order. One was worked across the system to Gniezno in April 2002. The local authority has taken over the line, and SKPL commenced regular passenger operations in November 2002 from Krosniewice to Ostrowy, Krzewie and Wielka Wies. Freight operations are also planned. The current timetable can be found at Peter Wilhelm's web site. The division also had a sub-shed at Dobre, from which Lxd2 diesels operated trains between Nieszawa and the sugar factory, and in December 1999 wagons were seen at Oscieciny on the line south towards Jerzmanowo. As well as the ‘Rollwagen’ (which were also worked occasionally to Koneck) there was sugar beet traffic from a loading point on the Nieszawa line. However, following PKP's cessation of narrow gauge operations the sugar factory has completely given up rail transport and the exchange sidings outside the factory gates have been lifted. Although the local authority finally took over the PKP lines, it is difficult to see what traffic can now be operated. The first section of this system opened as a metre gauge line in 1913 from Elk (a standard gauge junction with lines to Olsztyn, Ketrzyn, Olecko and Bialystok) to Borzymy with a branch from Laski Male to Zawady Tworki. An extension of the Borzymy line to Turowo opened for public use in 1918. In 1945 the railway was taken over by PKP and 1951 it was converted to 750mm gauge, with the metre gauge equipment being transferred to the Pomerania and Warszawa systems. The system has a total of 48km of line, and in 1989 it carried 183,173 passengers and 20,351 tons of freight. Following reductions in the timetable (services on the Zawady Tworki and the Kalinowo – Turowo section had already ceased) regular passenger services ceased in June 2001. There had been no freight traffic for some time. In September 1991 the line was registered as a monument by the local authority and attempts were made to create a museum operation. A wider variety of locomotives was brought in, including Px48 and Kp4 steam locomotives, and some old four-wheel coaches were loaned by the railway museum. The line has been taken over by the local authority and trains are running on summer weekends to Sypitki. Further developments may be in the pipeline. This line was built by the German army in October 1914 to 600mm gauge, from Rogow (on the standard gauge Warszawa - Czestochowa line) to Nowe Miasto on the Pilica river. After the summer offensive of 1915 the front moved east, and the railway became redundant. The track was lifted to Slupce, 4km from Biala Rawska. After the war the government intended to dismantle the rest of the line, but due to local pressure it was retained, and in 1922-26 much reconstruction took place to bring the 'temporary' military line up to the standard required to provide a permanent public transport service from Rogow, through Rawa Mazowiecka, to Biala Rawska. This timetable was somewhat different from that which had operated for several years. The 02.50 departure from Rogow was a new addition, and harks back to the days when many of the narrow gauge lines had services in the middle of the night. In line with virtually all Polish narrow gauge lines a revised timetable was introduced in early 2001 with a train leaving Rogow early in the morning for Biala Rawska, making a short run to Rawa Mazowiecka and back and then heading back to Rogow. The Rogow – Biala Rawska and Biala Rawska – Rogow workings were given slower timings to permit operation as mixed passenger/freight trains, but a visit in May 2001 showed no freight anywhere on the line and there did not appear to have been any for some time. The passenger timetable theoretically provided two return workings between Rawa Mazowiecka and Biala Rawska per day, but the first was in the early hours and the second returned to Rawa Mazowiecka about 10am. By mid-day the loco and single coach train was back at the depot in Rogow and clearly this token service would not last long. Services ceased in June 2001 and, although some freight traffic may have continued, this is likely to have ceased at the end of September. The line has been taken over by the Polish Narrow Gauge Railway Foundation, and trains were run on 1 November 2002, but it is not known what is planned for 2003. The first section of the 600mm gauge Kleinbahn des Kreises Znin opened from Znin to Rogowa (19.4km) on 1 July 1894, together with a branch from Biskupin through Gasawa to Szelejewo (8.2km). On 9 June 1895 the Rogowo line was extended by 12.3km to Osno. In 1908 a branch to Ostrowce was added, and in 1911 a further 15.8km branch opened to Obiecanowo. In the following year another 5.5km branch opened to Wola, and in 1913 the Szelejewo line was extended to Grochowiska Szlacheckie. Finally, a 2km section from Obiecanowo to Zuzoly brought the system up to 78km. On Polish independence the line became the Zninska Kolej Powiatowa but in 1949 it became part of PKP. At this time the line carried about 800,000 tons of freight and 40,000 passengers annually. However, passenger services ceased in 1962, and the Szelejewo – Grochowiska Szlacheckie section closed the following year. In 1972 the Obiecanowo – Zuzoly section closed, together with the Wola branch and Rzym – Osno. The Ostrowce line closed in the late 1970s, and the rest of the Obiecanowo line in 1992. By this time freight traffic was mainly (if not exclusively) seasonal sugar beet traffic to the works in Znin. Freight services were withdrawn in 1995 and the Rzym branch and Gasawa – Szelejewo section were closed. In 1976, however, seasonal tourist passenger trains had returned to the Znin – Wenecja – Biskupin – Gasawa section, and these continue to operate. The timetable varies from one year to another, but in 2000 it showed up to 6 trains per day each way, depending on time of year. Services only run from April to September. Trains have been operated by steam using Px38-805, although this does not appear to have been in operation for the last couple of years. Otherwise trains are hauled by Lyd2 diesels. The Wenecja Railway Museum opened in 1972, and contains a collection of at least 17 steam locomotives and a variety of rolling stock and other items. It is situated beside the railway, but the display tracks are not connected to the running lines. The museum area (all outdoors) is being extended, seemingly to accommodate items from the Bydgoszcz system. A museum guide in Polish lists all the locomotives, dates, numbers and their location in the museum (although these have changed in some cases). Although a German/English version is available it does not include this list. The railway also runs past the archaeological museum at Biskupin, which has a wealth of information about the early settlement of Poland, and remains of one of the earliest settlements, discovered about 70 years ago. It is well worth a visit. Andrzej Rosiak’s book “Zninska Kolej Powiatowa 1894-1994” was published by Muzeum Ziemi Paluckiej in Znin to celebrate the centenary of the line, but copies of it do not appear to be available now. 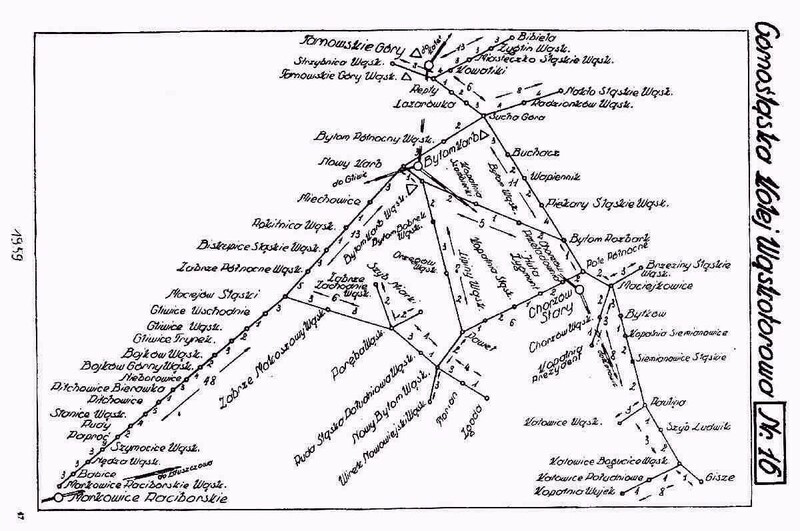 However, the history of the line is also covered by Bogdan Pokropinski’s book on the railways of the Bydgoszcz area (see the page for that system). Andrzej Rosiak's book 'Zninska Kolej Powiatowa 1894-1994' was published by Muzeum Ziemi Paluckiej in Znin to celebrate the centenary of the line, and copies may still be available. The Line has 3 working Lyd2's, and Poland's last working 600mm Steam loco, a Px38. The first section of this system opened in 1854 to the unusual gauge of 785mm. This dimension came about through the Prussian ‘zoll’ (inch) being 26.15mm, slightly larger than the British inch of 25.4mm. Therefore, while the British 2 foot 6 inch (or 30 inch) lines were 762mm gauge, the Prussian equivalent of 30 zolls came to 785mm. In 1989 there were 162km of lines (in 1959 there had been 188km), on which were carried 132,216 passengers and 2,322,587 tons of freight. Although the system was always fundamentally a freight railway (the only public passenger services were on the Gliwice – Rudy – Raciborz line and these finally ceased in 1991), a timetabled ‘tourist’ service has run on part of the system in recent years. Freight traffic appears to have ceased in about April 2001, but the summer trains continued to operate. A Romanian railcar arrived in May 2001, in connection with a proposal to operate passenger services on part of the remaining line. Negotiations over the future of the line finally made some progress and summer passenger services have recommenced. On the former Gliwice – Rudy Raciborz line a preserved railway is finally taking shape at Rudy, with trains believed to be on offer at weekends through the summer between Rudy and Stanice (about 4km) and between Rudy and Paproc (about 2km). The system is described very fully in Krzysztof Soida’s book “Koleje Waskotorowe na Gornym Slasku”. Volume 1, ISBN 83-85831-82-7, was published in 1995. While the text is in Polish the index, summary and titles to tables and illustrations are also in German. As well as the text in Part 1, there is a series of sheets of plans of stations and so on in Part 2. Volume 2, ISBN 83-912575-0-9, has recently been published and deals with the technical aspects. Volume 3 is a huge photo album, ISBN 83-904079-6-5, published by EMI-PRESS in 1999. From the same author is “Kolej Gliwice Trynek – Rudy – Raciborz”, ISBN 83-904079-2-2, also published by EMI-PRESS. The Powiatowa Kolej Sochaczewska (Sochaczew District Railway) was built in 1921 from Sochaczew (where there was a connection with the standard gauge Warszawa – Lowicz line) to Tulowice; it officially opened in 1922. In 1923 it was extended to Piaski Krolewskie (26km from Sochaczew) where there was a connection with a 600mm gauge forestry railway which had been built by the Germans during the First World War. A 6km branch was also built from Tulowice to a station on the banks of the river Wisla. Although the station was called Wyszogrod that town is actually on the other side of the river, connected by what is believed to be the longest timber bridge in Europe – in 1997 it was in poor condition and a new bridge was under construction a little way downstream. After the Second World War the line was taken over by PKP. In 1968 a 2.4km section on the northern fringe of Sochaczew became mixed gauge when a standard gauge line was added to reach an industrial plant. The 15.35 departure from Sochaczew to Wyszogrod on 30 November 1984 was the last timetabled train. On the following day the line was taken over by the Railway Museum (of Warszawa) and opened as Muzeum Kolej Waskotorowej on 6 September 1986. As part of the museum’s activities trains are run from Sochaczew to Wilcze Tulowskie (17km). The line beyond that point to Piaski Krolewskie has been abandoned, as has the line to Wyszogrod (although at least some of the track is still in-situ). The 2001 summer timetable showed one train each way on Saturdays June to September. Motive power for the trains consisted of PKS3, Px29-1704 and Px48-1755, although only the Px29 appears to be serviceable now. PKS3 was built for the line in 1925 by Orenstein & Koppel. The 90hp 0-8-0T worked throughout the line’s independent days, and following the PKP take-over was re-numbered Tx2-1246. In 1961 it became Tx4-1315 and in 1970 was transferred to Piotrkow Trybunalski, where it was used as a stationary boiler until going to the Warszawa Railway Museum in 1973. It returned to Sochaczew in 1986. The Px29 is another interesting locomotive, being Poland’s only operational example of the class, originally designated Wp29, which was later developed to become the Px48. Lyd1 diesels are also available for traffic. The museum itself is located at the former Sochaczew Wask. station. There is a range of locomotives and rolling stock displayed, from a variety of sites, including some 785mm gauge examples from Upper Silesia. The greatest concern is that all these items are outdoors all year round, and will inevitably deteriorate in time, although they are well looked after and regularly painted. The ‘reserve’ collection, which is kept hidden away behind high fences, contains many more items, some in very poor condition. The railway’s history is described in Bogdan Pokropinski’s book “Powiatowa Kolej Sochaczewska” published by Muszeum Kolejnictwa w Warszawie. Copies were on sale at Sochaczew in October 1997. Special trains can be run to order. The museum is open from 10.00 to 16.00 except Mondays – it may close earlier on some days. Train services are included in the PKP timetable. Muzeum Kolei Waskotorowej, Towarowa 7, PL-96-500 Sochaczew, tel. (0-494) 224-05 wew. 341. In 1915 the Austrian army built a 600mm gauge supply railway from Jedrzejow (on the standard gauge Krakow - Kielce line) east to Motkowice on the river Nida. When the military situation was consolidated the line was rebuilt in a more durable form, and it was extended further east to Bogoria with a 2km branch to Chmielnik. A 16km section was also built north from Bogoria to Iwaniska, and the sugar works in Wlostow built their own 20km line linking the works to Iwaniska. In 1918 the new PKP took over the Jedrzejow – Bogoria – Iwaniska line and a further section was built south from Bogoria to Staszow. In 1923 an independent line was built further south from Staszow to Rataje and in 1926 this was extended via a large timber bridge across the Wisla to Szczucin, terminus of a standard gauge branch from Tarnow. A second narrow gauge line was built by the Austrian army in 1917 from Kocmyrzow (terminus of a standard gauge branch from the Krakow area) to Posadza. A third line was also built from Miechow (now Charsznica on the Krakow – Kielce line) 38km east to Dzialosyce. In 1924 the local authority of Pinczow built a line south from Hajdasek, on the Jedrzejow line, to their town. The following year this was extended south to Kazimierza Wielka and a branch was built from Cudzynowice west to join the existing line at Dzialosyce. In 1926 the Kazimierza line was extended to Posadza, linking with the existing line from Kocmyrzow, thus joining all the sections together. In 1930 the Pinczow district lines and the private Staszowo – Szczucin line were taken over by PKP, which now controlled a total length of 308km. In 1944 the system was cut in two by military activity. The eastern end was in Russian hands and, to supply materials, a further section was built from a standard gauge connection at Tarnobrzeg to Bogoria. In 1945 however, the front had moved west and the line was dismantled from Tarnobrzeg to Koprzywnica, together with the temporary bridge over the Wisla. Traffic serving Wlostow sugar works now joined the new line at Jachimowice. In 1950 the Pinczow – Hajdasek section, with 4% gradients, was by-passed by a new link from Pinczow to Umianowice, and in 1950/51 the whole system was converted to 750mm gauge, with Px48 and Px49 locomotives and new rolling stock being introduced. giving a network total of about 340km, but the Bogoria – Iwaniska section closed that year. In 1989 there were still 274km of track, on which 421,556 tons of freight were carried, but passenger services had already ceased. In 1990 most of the Bogoria – Szczucin line was lifted, and the Charsznica – Dzialoszyce line followed in 1992. The whole system closed to freight traffic on 1 February 1993, although in 1996 official records showed 161.9km as being in operation. Tourist trains had started running some years prior to closure on the Jedrzejow – Wislica section, but following damage in spring 1997 these operations were cut back to Pinczow. Trains consisted of a variety of stock hauled by a Lxd2 or Px48. The 2000 timetable showed a single working Jedrzejow – Umianowice – Jedrzejow on Sundays and holidays through the summer, but in 2001 only a single day's operation was shown. The local authority is believed to have taken over the line, but obviously only for tourist traffic. One of the locomotives from the Pinczow railway, Tx26-422, was the first narrow gauge steam locomotive built in Poland. After conversion of the Jedrzejow system to 750mm gauge it was transferred to the Bydgoszcz system and is now in the museum at Wenecja. This line dates from the first years of the twentieth century, when Malopolskie Towarzystwo SA of Lwow built a 760mm gauge line (this part of Poland was then ruled by Austria) from Przeworsk (on the standard gauge Rzeszow – Przemysl line) 46km to Dynow. After the First World War the line was taken over by PKP. It has the only tunnel on a narrow gauge railway in Poland, near Jawornik Polski, being 602m long and passing 30m under the ground. In 1989 the line was quoted as 750mm gauge and carrying 12,669 passengers and 79,454 tons of freight. In 1991 it was registered as a monument by the local authority. In recent years freight was carried (standard gauge wagons on ‘Rollwagen’) from Przeworsk to Kanczuga and Jawornik Polski, but only low wagons could reach Dynow, and there does not appear to have been any freight beyond the tunnel for some time. There were reports of sugar beet being carried in standard gauge wagons (the narrow gauge connection to the sugar works at Przeworsk having been broken a few years ago) but a visit in autumn 1998 was a few days too early to verify these reports. PKP ran tourist trains on the line, with a single working each way on summer weekends. In July 1999 a festival at Dynow led to a special train being run, and the unprecedented sight of this train crossing the timetable service at Manasterz. Following the end of PKP's narrow gauge operations it was initially suggested that the local authority would take over the line, with Connex as operator. However, negotiations with Connex appear to have been unsuccessful and it is now understood that SKPL are the operator, with trains running at weekends through the summer, and plans for freight traffic in 2003. The first section of this 750mm gauge system opened in 1917. The line runs from a standard gauge interchange at Opatowek, through Zbiersk (the main depot) to Turek, a distance of 57km. A second line ran 12km from Zelazkow to Kalisz, and a branch from that line ran 3km to Russow. In 1989 the line carried 18,722 passengers and 408,286 tons of freight. The line to Kalisz closed in the early 1990s, when passenger services ceased, but the Russow line was still in use in 1996 to carry sugar beet to the works in Zbiersk. The beet traffic has now ceased, and the track used for this to enter the works has been lifted. The extensive facilities at the main stations indicate that the line was once extremely busy. The local authority has taken over the line, with SKPL as operator, and initial problems with PKP over the transfer of freight traffic appear to have been overcome. Passenger trains are available to order, but plans for regular services have not yet been realised. giving a system total of 150km. In 1961 the line was regauged to 750mm, and in 1973 ‘Rollwagen’ were introduced. During the 1970s the line carried around 370,000 tons of freight and 170,000 passengers annually, but in 1986 the passenger service ceased. By 1989 there were 69km of track, and 225,476 tons of freight were carried. In 1994 the line was registered as a monument by the two local authorities through which it runs. The line today runs from Mlawa through Przasnysz to Makow Mazowiecki. The line from Grudusk to Ciechanow and back to Krasne is closed, together with the line beyond Makow Maz. to Zamosc. A ‘skansen’ at Mlawa has a Px48 and ‘Brigadelok’ on display, but there are no operational steam locomotives. Charter trains, consisting of a Lxd2 and Romanian coaches, are available to order. Prices vary according to the number of coaches and length of journey desired. In 1998 the cost of a locomotive and two coaches Mlawa – Przasnysz – Mlawa was 1269.60zl. There are reductions for persons under 26 years of age. This is one of the newest narrow gauge railways in Poland, having opened as a 750mm gauge line in October 1950. It runs from Nasielsk (on the standard gauge Warszawa – Ilawa line) to Pultusk (26km) and had triangles at each terminus to turn locomotives. Passenger services ceased on 2 May 1996, but in 1989 the line carried 89,211 tons of freight. Freight is carried by ‘Rollwagen’ hauled by Lxd2 diesels. Tourist trains run to order, the 1998 price for a locomotive and two coaches Nasielsk – Pultusk – Nasielsk was 834.40zl. Such trains consist of Romanian coaches, again hauled by Lxd2 diesel. giving a network total of 125km. By 1989 only the Piaseczno – Nowe Miasto section remained, and that carried 24,447 passengers and 178,571 tons of freight. Regular passenger services ceased in 1991 but ‘tourist’ trains, using a Px48 or Lxd2 with Romanian coaches, continued to run to order. A visit in 1994 found some freight traffic still being carried, but this is believed to have ended in 1996. It has recently been reported that the line has been taken over from PKP, but it remains to be seen what the future holds. giving some 52km in total. Diesels (Lxd2) were introduced in 1968/9, and Romanian coaches in 1988. In 1989 the 750mm gauge line still had 51km of track and carried 78,056 passengers and 149,598 tons of freight. The Wilkow branch closed in 1990 and passenger traffic ceased in 1993, so by 1996 only 38.1km remained in use. The depot and station at Karczmiska were situated to the west of the 'through' line, with a triangular junction. There was also a triangle at Rozalin and turning triangles elsewhere. In autumn 1998 coal was being carried in standard gauge 4-wheel wagons on 'Rollwagen' from Naleczow to the sugar factory at Opole, where a filthy Lyd2 shunted the sidings. The line ran through rolling countryside with some very attractive sections featuring curves and gradients. There had been rumours of the Wilkow branch being reopened, but in July 1999 a bridge on the branch had recently been removed, possibly to repair one on the main line. There was believed to also be some freight traffic to a factory at Poniatowa which allegedly also had a WLs150 shunter, but the factory is surrounded by double barbed wire fences, so it seemed prudent not to investigate too closely. Passenger trains ran to order and there were generally a few days each year when they ran for the general public. There have been reports that the local authority has taken over the line, but no trains are believed to have been run. The first section of this line, from Nowy Lupkow (on the standard gauge line running south from Zagorz) 25km to Majdan near Cisna opened in 1898 to 760mm gauge. It appears to have been worked by the Austrian state railway but suffered much damage in the First World War and the ensuing struggles in this area. A privately operated extension opened in 1904 but closed in the 1930s. Further devastation followed during and after the Second World War, and the railway did not reopen (to 750mm gauge) until the early 1950s. In 1959 a branch opened from Smolnik, a few kilometres west of Nowy Lupkow, to Rzepedz, partly along the route of an earlier line. There was also an extension east from Cisna reaching Przyslup in 1961 and Moczarno in 1964. The railway now had a length of 75km. Although primarily a forestry railway, passenger (or mixed) trains were run in the early years and again from 1963. Timber traffic steadily declined, and ended in the mid 1990s. Passenger services (now attracting tourists rather than providing a public transport service) also ceased for a year or two, but have now been revived. The line appears to be under gradual renovation, with services in 2001 running east from Cisna to Przyslup and west to Wola Michowa. As well as the timetabled services, trains can also be run to order. The first section of this 600mm gauge forestry line, south east of Bialystok, opened in the First World War. At one time there were 360km of track but after the Second World War the eastern part of the system found itself in the Soviet Union, and only 160km remained in use in Poland. Steam operation ended in 1974, following which trains were hauled by V10C diesels until timber traffic ceased in 1993. It is hoped that an 11km section from Hajnowka to Topilo can be used for tourist trains, for which ‘Brigadelok’ Tx1112 was used, although the locomotive is believed to be in need of overhaul. The future of the line is by no means secure. Tuczno sugar factory is located to the north west of Inowroclaw. A 900mm gauge railway was built here in the 1890s, and by 1914 there were 70km of lines, with 5 or 6 locomotives and 180 wagons. In 1941 the railway of Wierzchoslawice sugar factory was taken over, and in 1942 the system was converted to 750mm gauge. In 1943 there were 220km of track, 13 locomotives and 1123 wagons. The system then steadily declined so that by 1990 there were 60km of track, 8 diesel locomotives and 136 wagons. In the autumn and early winter beet is carried to the works from Przybranowo (once the junction with PKP’s line to Aleksandrow Kujawski) and Murzynno. The railway uses Lxd2 diesels for line work and WLs150 diesels for shunting. The track was completely renewed in the 1980s and the line is worked quite intensively. It is to be hoped it will continue to operate for some years. Dobre sugar factory's railway came into being in 1908. By 1912 the 750mm gauge line had 56.5km of track, 2 locomotives and 80 wagons. The railway was requisitioned by the Russian military in 1914, but was subsequently used by the German army. Between the wars a number of new lines were built, and by 1944 the works had 86.4km of track, 8 steam locomotives and 170 wagons. The post-war decline in use of such railways meant that by 1990 there were 45km of track, 5 diesel locomotives and 120 wagons. The pattern in the late 1990s was for two Lyd2 locomotives to bring beet in from Stroszewo over the works’ own line, running partly over PKP track to reach the works. PKP also brought in beet from Lowiczek, on the Nieszawa line, using Lxd2 diesels and narrow gauge wagons. Within the factory and transfer yard WLs150 shunters were used. Unlike Tuczno and Kruszwica the factory had no standard gauge link, so coal and limestone were brought in and finished products taken away by PKP using 'Rollwagen'. The 2001 campaign was however the last to use rail transport, and the rolling stock has been sold or scrapped and all the track lifted. The Kruszwica sugar factory railway dates back to 1882, and by 1914 the 716mm gauge line had 130km of track, 13 locomotives, 963 wagons and 1 coach. In 1923 the line was converted to 750mm gauge and over the following years the system continued to grow, incorporating the Matwy sugar works system in 1948. By 1950 there were 320km of track, 30 steam locomotives, 1800 wagons and 6 coaches. In the 1960s the system began to shrink, but in 1993 there were still 134km of track, 11 diesel locomotives, 660 wagons and 3 coaches. In 1996 the heaviest traffic was on the lines to Nowa Wies and Piotrkow Kujawski (the PKP line to here from Sompolno was already disused). Lyd2 locomotives performed most of the haulage work, with WLs150 locomotives shunting at loading points and within the factory. On the line north to Walentynowo there were numerous small loading points and, because, of axle-load restrictions, only WLs150 locomotives and light wagons could be used. Unlike other sugar factories, which only used bogie wagons, Kruszwica used a wide variety of bogie and four-wheel wagons of varying antiquity, origin and condition. By 1998 the operation had changed somewhat, and only the Piotrkow and Nowa Wies lines were in use. All beet traffic was carried to the factory in large bogie wagons, of the type once widely used by PKP. The older, smaller, bogie wagons and four-wheel wagons were used only for bringing the beet pulp back out from the factory to be spread in the fields. Several Lyd2 locomotives and at least one Lxd2 were used for hauling beet trains, and WLs150 locomotives were used to haul trains of up to 70 empty four-wheel and small bogie wagons back to the factory. In December 1999 the line north towards Walentynowo was seen to have been recently lifted, and the 2000 campaign was the last for the Nowa Wies branch, which has also now been lifted. During the 2001 campaign the pattern of operation appeared to be a train of empties out from the factory hauled by Lxd2, followed by another train of empties hauled by Lyd2 and a train of pulp hauled by WLs150 (also taking out the track gang), passing the Lxd2 and Lyd2 as they headed back to the factory with loaded trains of beet. Thus only three return workings ran each day, all at extremely low speed. The factory has bought its own road lorries and the 2002 campaign is believed to have been the last for the railway. The first section of the 600mm gauge Wirsitzer Kreisbahn opened on 21 February 1895 from Bialosliwie (on the standard gauge Pila – Bydgoszcz line) to Lobzenica (30km), with a branch from Czajcze to Wysoka (5km). A year later it was extended 18km from Lobzenica to Witoslaw. Later extensions included lines to Bialosliwie Port, Wysoka – Mosciska – Kocik Mlyn (providing a loop from the main line), Naklo – Zaklady Przem. (46km), and Trzeciewnica (near Naklo) – Suchary (6km). In 8 years 167.5km of line were built. After the First World War the line became the Wyrzyskie Koleje Powiatowe, and in 1923 the Kocik Mlyn – Mosciska section was dismantled. Renewed construction of this line began in 1944 but was not completed, and it was dismantled in 1946-1948. Meanwhile the first section of the Bromberger Kreisbahn, also 600mm gauge, had opened on 12 May 1895 from the standard gauge station at Maksymilianowo (on the Bydgoszcz – Gdansk line) to Gadecz. A week later another section opened from Bydgoszcz to Koronowo (25km) with a branch from Morzewiec to Kasprowo (11km). Further sections were added from Kasprowo to Wierzchucin Krolewski (15km) and Kasprowo – Suchary (10km), where it was later joined to the Wirsitzer Kreisbahn). Another branch followed from Lukowiec to Wawelno (6km), while at the eastern end the line was extended from Gadecz to Wloki, and numerous branches were built to agricultural estates. The two sections of the Bydgoszcz system were linked in 1907 when a bridge was built across the river Brda and the Maksymilianowo – Smukala Gorna line opened. This system now totalled 105km. After Polish independence it became the Bydgoskie Koleje Powiatowe. In September 1939 the bridge over the Brda was destroyed and traffic over the Smukala Gorna – Smukala Dolna section was suspended. Traffic on the isolated eastern section continued until 1949, mainly in the autumn period of harvesting crops. In 1949 both the Wyrzysk and Bydgoszcz lines were taken over by PKP and operated as the Bydgoskie Koleje Waskotorowe. PKP took over 256km of lines, 6 transhipment stations (with the standard gauge), 8 locomotive depots and two repair shops in Koronowo and Bialosliwie. In 1955 the system carried 256,000 tons of freight and 1,474,000 passengers. In 1969 passenger traffic ceased on the Bydgoszcz – Koronowo route and in the following year the Bydgoszcz – Morzewiec section was lifted. In 1973 the Wysoka Wask. – Mosciska section closed; Debno Wyrzyskie – Witoslaw closed in 1988. In 1989 there were 162km of line and traffic amounted to 8,307 passengers and 115,163 tons of freight. In 1991 the Wtelno – Koronowo and Lukowiec – Wawelno sections closed, and the Radzicz Rozgraniczenie – Zaklady Przem. and Liszkowo Rozgraniczenie – Debno Wyrzyskie sections followed in 1992. The remaining sections, totalling 107km, were closed from 1 January 1994. At the beginning of 1996 the system was recorded as having 153.1km of track, with none of it operational. Part of the system based at Bialosliwie has been taken over by the local authority in Pila. In summer 1999 the majority of the goods rolling stock was scrapped, but by spring 2000 work was under way clearing the line, with the eventual aim of running tourist trains to Lobzenica. Public passenger trains were finally believed to have started operation in 2002 over the first few kilometres from Bialosliwie, with plans for further extension in 2003. The first section of this 750mm gauge line opened in 1886 as an industrial railway serving the sugar factory at Opalenica, which was later opened as a public railway. The main depot and standard gauge interchange were at Opalenica, on the Poznan – Berlin line. At one time there were lines to Komorowo (34km), Nowy Tomysl (18km from the junction at Trzcianka Zachodnia), Duszniki (10km from Trzcianka Zach. ), Turowo (9km from Sliwno on the Duszniki branch) and Sedziny (10km from Rudniki Dwor I) giving a total network length of 81km. In 1989 there were 53km of lines (presumably Opalenica – Lwowek with branches to Nowy Tomysl and Duszniki), and annual traffic was 217,183 passengers and 94,065 tons of freight. In July 1994 passenger services were worked by Romanian-built rail-cars and freight services (which appeared to be virtually limited to seasonal sugar beet trains) by Lxd2 diesels. The main line terminated at Lwowek, and the branch to Duszniki was open for freight only. The line from Trzcianka Zach. towards Nowy Tomysl had only recently been lifted. Steam-hauled excursions were on offer, using a Px48 and ‘traditional’ coaches, and there was an outdoor museum adjacent to Opalenica station. A further visit in September 1995 found that the line had recently closed to all traffic, and a bus had been laid on for passengers. There were hopes that a local group would be able to take over the line, which was the oldest narrow gauge railway in Wielkopolska. However, by October 1996 the historic rolling stock from the museum had been removed, and the ‘traditional’ coaches (and possibly the working Px48) had been moved to Sroda. By October 1997 there was little stock remaining on the railway, although the track was still in-situ. Some special trains were operated in 2000, and in September 2001 it was reported that passenger trains had started running again between Opalenica and Trzcianka Zach., with extension to Lwowek planned. A visit in November 2001 found a timetable at Trzianka showing a quite frequent service, but this was not running. Personnel at Opalenica confirmed that the only trains on offer were to order, at a price of 2000zl. for a return working to Lwowek. A Lxd2 and Lyd1 diesels are operational, with a Px48 steam locomotive in the shed, on which work is believed to be starting in January 2002. However by the following November the site looked deserted and clearly no trains had run for some time. Maciej Matuszewski's book "Z dziejow Opalenickiej Kolei Dojazdowej 1896-1991”, published by Poznanski Klub Modelarzy Kolejowych in 1991 is unfortunately no longer available. This is claimed to have been the first narrow gauge passenger railway to be opened in that part of Poland under Russian control, in 1904. It was operated by three Borisg 0-6-0Ts from its opening until 1954. At one time the line ran from Piotrkow Trybunalski (on the standard gauge Warszawa – Czestochowa line) to Sulejow Pilica, but was later cut back by 2km to Sulejow. It would appear that the passenger service ceased in 1987. In 1989 the 750mm gauge line was 15km long and carried 102,846 tons of freight. The freight service ceased in the early 1990s, but the track is mostly still in place, together with rolling stock at Piotrkow. A group of enthusiasts under the name Towarzystwo Przyjaciol Kolejki Waskotorowej Piotrkow – Sulejow is attempting to revive the line. It is understood that trains can now be run to order as far as Bugaj (about 5km), but that further restoration is threatened by road widening. The first part of this 750mm gauge system was built in 1891 by the sugar factory at Nowy Staw, 4.5km to Koscieleczki. It was not until 1898 that further lines were built by a separate company, from Lisewo to Ostaszewo (22km) with a branch from Lichnowy through Nowy Staw to Lipinka Gdanska (17km), with a connection to the existing line. Another line was built south from Lisewo through Pogorzala Wies to Miloradz (12km). In 1900 further lines were constructed from Malbork: east for 27km to Stalewo; north to Lipinka Gdanska (13km); and south to Miloradz (8km). In the following year a further extension was built from Ostaszewo to Nowy Dwor Gdanski (15km). In 1905 several lines were built further to the north: from Gdansk 27km through Przejazdowo, Koszwaly and Cedry Male to Lewy Brzeg Wisly (Left Bank of the Wisla); from Przejazdowo a 38km loop through Osice and Giemlice to Koszwaly; from Prawy Brzeg Wisla (Right Bank of the Wisla) eastwards for 17km through Stegna to Sztutowo; and from Stegna 15km south to Nowy Dwor Gdanski. The two stations on each side of the Wisla were linked by a train ferry. In 1909 there were further extensions, from Stalewo 3km to Swietliki, and from Nowy Dwor Gdanski 21km to Lipinka Gdanska. The latter completed the third ‘circular’ loop of the system. In 1920 another branch was built from Jeziernik to Zulawki Polnocne (12km). With various branches the network now reached about 336km. During the Second World War a further line was built from Sztutowo along the coast to Krynica Morska. However, by the end of the war the area had suffered much damage, and reconstruction of the narrow gauge network continued until 1951. The Sztutowo – Krynica Morska line closed as early as 1953, and the Malbork – Swietliki section was handed over to the sugar works in 1958. By 1959 the network had shrunk to about 223km. The Jeziernik – Zulawki Polnocne line was lifted in 1969, passenger services on the Stegna – Wisla – Koszwaly section ceased in 1971, and the whole network west of the Wisla closed in 1974. Passenger traffic was suspended on various sections in the late 1980s and early 1990s. In 1989 the system had 146km of track, on which were carried 365,800 passengers and 89,944 tons of freight. At the beginning of 1996 it had 146.3km of track, of which 138.3km was operational. Although summer tourist trains had been run for some years, passenger services ceased completely in September 1996. Sugar beet was carried to Nowy Staw sugar works during that autumn, but the system then closed completely. There were hopes that at least part of the system could be preserved in some way, then came news that the system was being completely dismantled. There is now a restoration attempt on the northern section of the system, from Mikoszewo (on the right bank of the Wisla) through Stegna to Sztutowo. A first train ran in August 2002 from Nowy Dwor Gdansk to Stegna, but regular services do not appear to have started. This 750mm gauge line opened as recently as 1950, from a standard gauge connection at Starachowice to Ilza. In 1989 it was recorded as being 20km long and carried 61,988 tons of freight; the passenger service had already ceased. The line has now closed completely, and in 1998 there was no evidence of any rolling stock, although the track was still in place. There may have been some items in the shed. The 'Jarotschiner Kreisbahn' opened as a 600mm gauge railway on 1st November 1902, from Witaszyce to Komorze (29.0km) with a 4.4km branch from Sucha to Robakow. Traffic in 1911 amounted to 27,928 passengers and 45, 116 tons of freight. About 1965 some 140,000 tons of freight were carried annually. In 1977 diesel traction replaced steam and, because the new locomotives were too large to pass under the standard gauge railway to reach the sugar works, the sugar beet traffic was lost. In 1981 the line carried 69,000 passengers and 48,000 tons of freight; the corresponding figures in 1986 were 58,000 and 41,000. The Grabina – Trabczyn line closed in 1972 and the Lgow – Przybyslaw and Twardow – Czermin sections followed in 1979. Sucha – Komorze, much of the original main line, closed in 1987, and the remaining Witaszyce – Zagorow line closed in 1991. The track was lifted and the rolling stock scrapped, although some (including one of the 1930s rail-cars) was rescued by the Malta railway in Poznan, and three Lyd2 diesels moved to the Welsh Highland Railway in Britain. One of the line's steam locomotives, after working on various other PKP lines, survives in the Wenecja Railway Museum near Znin. Two other steam locomotives were sold abroad in the 1970s, but their fates are not known. Maciej Matuszewski's book "Z dziejow Jarocinskiej Kolej Dojazdowej 1902 – 1987", published by Poznanski Klub Modelarzy Kolejowych in 1988, is no longer available. The history of the line is also covered by Robert Lewicki's "Kolej waskotorowa w krajobrazie Ziemi Zagorowskiej", published by Wojewodzka Biblioteka Publiczna, Konin in 1997, ISBN 83-87582-00-X. Copies of this may still be available. Witaszyce brickworks had its own railway, built at the turn of the century and originally worked by horses. As early as 1911 a 12HP petrol locomotive was in use. By 1916 the railway was about 3km long, running from the clay pit to the brickworks, and used a small O&K steam locomotive and about 40 skip wagons. It had a level crossing with the PKP line out of Witaszyce, as well as the main road. A variety of steam locomotives, mostly second-hand, were used over the years, until WLs40 diesel locomotives were introduced. The last steam locomotive was scrapped in the early 1960s. In recent years there were five diesel locomotives. The railway was operational well into the 1990s, continuing for several years after PKP’s line closed. Sadly, however, it appears that the brickworks line has also now closed, probably in 1997/8. Little is currently known about this system, which is also referred to as the Wroclawska Kolej Waskotorowa, and appears to have been formed from two separate operations. Dating from 1894, it once ran from Zmigrod (on the standard gauge Leszno – Wroclaw line) 8km to Przedkowice where the route split, a 44km line running through Trzebnica to Wroclaw, and a second line running 29km to Milicz and on another 23km to Sulmierzyce, giving a total network of 104km. In 1989 it was recorded as being 750mm gauge, having 78km of track (presumably Zmigrod – Przedkowice – Trzebnica and Przedkowice – Milicz – Sulmierzyce), carrying 147,051 passengers and only 469 tons of freight. The system closed in 1991.
giving a total of 147km. Originally the line south to Bykow had extended to Uhnow but in the early 1950s the Polish/Soviet border in this area was moved, and Uhnow is now in Ukraine. Thus the railway was cut back by about 6km. By 1989 the system had shrunk to 41km of track and carried 60,153 passengers and 71,780 tons of freight. In 1996 it was recorded as having only 12.0km of track remaining. A date of 1990 has been quoted for closure, and it is not known which was the last section to survive, but at least part of the system is believed to have been scheduled as a monument by the local authority. More information would be welcomed. The first section of the Marienwerder Kleinbahn opened in 1901 from Kwidzyn (Marienwerder) 4km to Mareza (Mareese), and from there 14km northwards to Gurcz (Zandersfelde) and 21km southwards to Rusinowo (Reussenau). In 1905 a further line opened from Pastwa (just short of Gurcz) through Gniew and then 12km to Wielkie Walichnowy, where it connected with the Pelplin sugar works railway. Between Pastwa and Gniew the line crossed the Wisla by means of a train ferry. After the First World War the new border was drawn along the east bank of the Wisla. To the east the Rusinowo – Mareza, Mareza – Kwidzyn, Mareza – Pastwa Poludniowa and Pastwa Osiedle – Gurcz sections (totalling 36km) were under German control. Under Polish control were the section west of the Wisla and a relatively short section on the east of the Wisla, totalling 18km. The Polish administration decided that its portion was not worth operating. The northern section from Cieple to Wielkie Walichnowy was taken over by Pelplin sugar works, and the remainder dismantled. On the German side the town of Gurcz was cut off from the rest of the network, and in 1927 a 3km link was built to the east of the new border so that the town could be reconnected. After the Second World War the whole area came under Polish control, and in 1948 there were plans to build a 22km connecting line to the southern loop of the Gdansk system. Construction work appears to have started but was never completed. Rail-cars were introduced in 1959 and steam traction ceased in 1966. Passenger traffic peaked at around 250,000 in the mid 1960s, but freight traffic was never particularly heavy – the figure of 50,000 tons in 1911 was never reached after the division of the system, and the post-war peak was about 30,000 tons in 1960. In 1985 the 39km system carried 124,170 passengers and 4,200 tons of freight. The last train ran on 31.12.1985 and the final section of track was lifted in March 1989. Rail-car MBd1-134 went to the Sochaczew museum. This 600mm gauge line is belived to have its origins in the Ortelsburger Kleinbahn which ran from Spychowo (Puppen) 15km to Rozogi. During the First World War a military field railway was built south from Rozogi. After the war the new border between Poland and Germany cut through this line, but both sections appear to have been operated by the respective state or regional railways. The German section, in particular, was very lightly trafficked; in 1938 it carried only 1,559 passengers and 5,356 tons of freight. The line was presumably retained for strategic purposes. The main depot was at Myszyniec. The northern end of the system is believed to have closed in the 1960s, but final closure came in 1973, when a number of locomotives were transferred to the Bydgoszcz system. Also known as the Kolejka Marek, this line originally had a gauge of 800mm and ran from Warszawa to Radzymin, to the north east of the city. It is not known whether there were once other lines, but the Warszawa Targowa – Targowek section opened on 21 July 1949. At some time in the 1940s a connection was made with the Jablonna line. The railway was converted to 750mm gauge in 1951, and in 1959 was given as 21km long. It is believed to have closed in the 1970s. More information would be welcomed. In 1898 in the area of Poland then known as East Prussia the Rastenburg – Sensburg Kleinbahn opened a 33km long 750mm gauge railway from Ketrzyn (Rastenburg) south to Mragowo (Sensburg), with a 19km branch from Slawkowo to Ryn (Rhein). In 1905 there followed a line north from Ketrzyn to Srokowo (25km) and an isolated line from Barciany 12km to Skandlawek opened for freight traffic at the same time. The 25km line from Barciany to Krylowo (Nordenburg) opened in 1916, and the following year the network was lined together by a 27km line from Winda (halfway between Ketrzyn and Srokowo) through Barciany to Gandawa. The system now amounted to about 130km of lines. The above dates are based on a German source. Other sources give different dates and sequences of opening. At Nordenburg the line connected with the Instenburger Kleinbahnen, of the same gauge. This line had opened in 1902 and had a total length of 190km. In 1945 a new border was drawn through this area, and most of the Ketrzyn system was now in Poland. However the northernmost 5km of the Gandawa line, and the end 2km of the Krylowo (Nordenburg) line were in the Soviet Union. The network had suffered considerable damage, and 75km of track had been removed to the Soviet Union. Reconstruction work started in 1946 and the Ketrzyn – Mragowo line reopened in 1948, with Slawkowo Ryn following in 1949. The system now amounted to 52km of track, and the northern section was never rebuilt. Traffic on the Slawkowo – Ryn section ceased in 1966. The Ketrzyn sugar works decided in 1969 to stop using the railway for transport, and in 1971 the railway closed completely. The town of Olesno is situated on the standard gauge line between Kluczbork and Upper Silesia. By 1913 there was a railway from Olesno north to Praszka, which appears to have been 750mm gauge. During the First World War the Germans extended this line from Praszka to Wielun sugar works. Following Polish independence the new border with Germany passed just to the west of Praszka, cutting it off from Olesno, so the narrow gauge provided the Poles with a useful link to the town. By 1959 the narrow gauge extended 28km from a standard gauge interchange at Wielun (on the line between Kepno and Upper Silesia) to Praszka – although the actual terminus was called Zawisna Wask. and was 1km beyond Praszka station. A 1963 map appears to show Zawisna as an interchange with the standard gauge line to Olesno, but no interchange is shown on the 1959 map. Nothing further is known of the history of this line, which had closed by 1989, and further information would be welcomed. In 1959 this 750mm gauge line extended from a standard gauge interchange at Zwierzyniec (south west of Zamosc) 27km westwards to Bilgoraj. The date of opening and subsequent history are not known. The railway network in this part of Poland has undergone considerable modification in the last thirty years or so, partly as a result of the post-war border with the Soviet Union having radically altered traffic patterns in the area, and partly as a result of construction of the Linia Hutniczno-Siarkowo the Russian gauge Steel and Sulphur line. The date of closure of the narrow gauge line is not known, and further information would be welcomed. Nothing is known of its history or date of closure, but this was certainly before 1989. This line ran from Jablonna, to the north of Warszawa, southwards along the east side of the Wisla, through the city to Karczew. It opened about 1900 to the unusual gauge of 800mm and from 1911 it was administered by the Towarzystwo Akcyjne Warszawskich Drog Zelaznych Podjazdowych (Warszawa commuter railway company). There appears to have been much conflict between the railway and the Warszawa highway authorities, and in 1926 two rail-cars were introduced but they lasted only until 1932 and 1934. Two 110hp diesel locomotives were introduced in 1937, but as they could pull only 3 bogie coaches they were not suitable for the regular trains. They were not used on service trains after 1941, but at least one appears to have survived until 1950 before being transferred elsewhere. In 1884 a 750mm gauge railway opened from Zittau through Kleinschoenau (now Sieniawka) and Reichenau (now Bogatynia) to Markersdorf, a total distance of about 16km. In 1890 a further line opened from Zittau through Bertsdorf to Oybin (12km) with a 4km branch from Bertsdorf to Jonsdorf. Markersdorf was on the German/Austrian border, and in 1900 a line opened from Friedland (now Frydlant) 11km to Hermsdorf (now Hermanice) on the Austrian side of the border, with a connecting line to Markersdorf. Trains between Friedland and Hermsdorf had to reverse at Detrichov. The Friedland – Hermsdorf line was probably unique within Austro-Hungary in that it was built to the same standards as the existing lines from Zittau, including use of the 750mm gauge rather than the 760mm norm for Austrian lines. Clearly the intention was to allow through traffic between Friedland and Zittau, but this never happened to any significant extent, even after German occupation in 1938. After the Second World War the network became divided between Czechoslovakia (Frydland – Detricdhov – Hermanice), Poland (Bogatynia – Sieniawka) and Germany (Zittau - Bertsdorf – Oybin / Jonsdorf. Presumably it was at this stage that the new Polish administration built a 6km section from Bogatynia to a standard gauge connection at Turoszow, for by 1959 the Bogatynska Kolej Waskotorowa ran 16km from Turoszow Wask. to Sieniawka. Nothing further is known about the Polish operation, which closed in 1961. The Czech section had a somewhat chequered life, with passenger services ceasing in 1946, resuming in 1948, ceasing again in 1951 and recommencing in 1957. TU 47 diesels arrived in 1958 and the line finally closed completely in 1976. The German lines survived and, still running regular steam trains, are quite well known to West European enthusiasts. In 1911 the Oletzkoer Kleinbahn opened a 1000mm gauge railway from Olecko northwards 27km to Garbas and westwards from Olecko 16km to Swietajno. In the early stages of the First World War the railway was heavily damaged and some of the rolling stock taken away by the Russians. However the railway was operational again by 1916. In the inter-war years the railway carried fairly light traffic. In 1938 the railway used 4 locomotives, 8 passenger coaches, 2 baggage cars and 36 freight wagons to carry 39,989 passengers and 18,469 tons of freight. The railway again suffered considerable damage in the Second World War, with destruction reckoned to be 85%. The Polish authorities decided that reconstruction was not justified, and the remaining rolling stock was transferred to Elk or scrapped. On 12 February 1911 a railway line opened from Chybie (on the standard gauge line between Krakow and Wien) to Strumien, about 5km. This part of Poland being under Austrian control at that time, the gauge was 760mm. The line was initially operated by 2 steam rail-cars, 4 passenger coaches and 4 freight wagons, but it is believed the rail-cars were later replaced by two locomotives. After Polish independence a standard gauge railway was built from Chybie through Strumien to Pawlowice (and later further). The opening of this line in November 1924 spelled the end for the narrow gauge line, and the last train is believed to have run on 15 March 1925. The Ostrowite sugar works railway was built in 1924. Little is known about its operation, but it ran about 25km from the works to a connection with PKP at Brodnica. At some time in its history it obtained a Kp4 steam locomotive. In 1987/88 it was registered as a monument, since it was the only operational 750mm gauge industrial railway in north-east Poland, and possessed the only operational Kp4. This locomotive last ran in 1989. The last beet was brought into the works by rail in 1992. The railway was operated for internal use in 1993, seemingly for the last time. Since then the monument registration has not prevented the line becoming completely overgrown and rails being removed (presumably stolen for scrap). The Brodnica end of the line has been dismantled (with retrospective consent from the authorities), but it is not known what has become of the remainder of the track or any of the rolling stock. This 600mm gauge forestry line, just south of Suwalki, was 27km long and dated back to 1923. It closed in 1991 and has probably been completely dismantled. At closure there were three steam locomotives which had been abandoned for some time, and some V10C diesels. As with Plociczno this 600mm gauge forestry line, north east of Bialystok, was built in the early years of Polish independence an closed in 1991. It is presumed to have been completely dismantled. Wlostow sugar works, west of Sandomierz, once had a 750mm gauge railway which ran south to connect with the eastern end of PKP’s Jedrzejow system. It is assumed to have closed, but confirmation of the situation would be welcomed. The first 12km section of the Pelplin sugar works railway was available for use in the autumn sugar beet campaign of 1895. By 1900 the works had 34km of line, 5 locomotives and 120 wagons. In 1922 the works took over a further 7km of the former Kwidzyn network. In the post-war period traffic diminished and use of the railway ceased at the end of the 1977 campaign. This 600mm gauge line is merely one of many which once operated all over Poland for various industrial operations such as brickworks, cement works and the like. The railway was built at the turn of the century and was originally worked by horses. As early as 1911 a 12HP petrol locomotive was in use. By 1916 the railway was about 3km long, running from the clay pit to the brickworks, and used a small O&K steam locomotive and about 40 skip wagons. It had a level crossing with the PKP line out of Witaszyce, as well as the main road. There were a number of other narrow gauge lines in Poland, and it is intended that further information will be added as it becomes available.